I. - Silence is the word most often used in connection with the paintings of Vilhelm Hammershoi (1864-1916). Hammershoi was a "strange" painter as his teacher, Kroyer, noted early on but that strangeness is more mysterious than received wisdom has it. 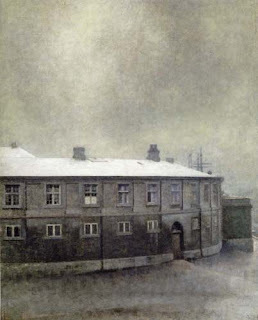 Hammershoi himself stated more than once that what attracted him, in both interior and exterior settings, was architectural elements and the relationships between them. As for the deliberate minimalism of Hammershoi's interiors, the Victorian taste for overstuffed interiors did not become poplar in Scandinavia. When the Hammershois stayed in London they rented rooms near the British Museum, asking that knickknacks be removed from the reception room as they distracted from the simplicity of the flat. Even in his portraits, Hammershoi avoided narrative, as he explained to his brother Svend (also a an artist) in a letter written from London, regular portraits did not interest him. 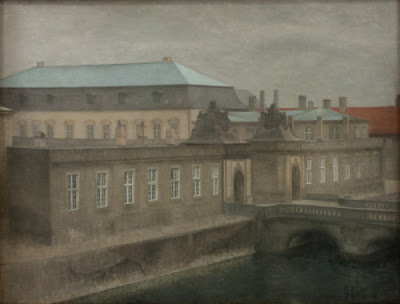 Of course, this left an opening for speculation that began with Hammershoi's contemporaries and continues to this day. What we are to make of the empty rooms that reverberate with emotions we cannot pin down? And what are we to make of the reserve of his human subjects, is it theirs or is it created by the painter? "...one may risk saying something infinitely decisive and be quite correct in what one says, and yet, ludicrously enough, say nothing at all. Hence it is a psychologically noteworthy phenomenon, that the absolute disjunction may be used quite disingenuously, precisely for the purpose of evasion." - Soren Kierkegaard, 1846, from Concluding Unscientific Postscript, p. 313, Swenson & Lowrie translation. But names like Kierkegaard or Hamlet are used as shorthand for anything Danish; the origins of Shakespeare's play Hamlet, Prince of Denmark are broadly Indo-European. Vilhelm Hammerhois and Ida Ilsted married in 1891 and lived together contentedly until the painter died from throat cancer in 1916. Ida often appeared in interior scenes, usually with her back to the viewer - again not a regular portrait but more a quiet domestic scene. Interiors of their various Christianshavn apartments (30 Strandgade, 25 Bredgade, 25 Strandgade) are uniformly buildings from previous centuries, their stone facades usually left unpainted. Even the brick facades that were in common use during the 17th century were painted in colors that imitated stone. 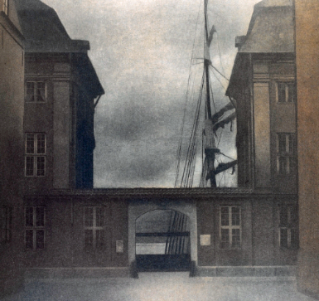 The large windows at 30 Strandgade faced the harbor, visible between wings of the Asiatic Company Building across the street. The Hammershois lived there from 1898 to 1909. The rooms opened on one another through a series of doors, rather than being organized around a central hall. Most importantly. large windows filled the rooms with light While they were in London in November 1912, their "dream" apartment at 25 Strangade in the Asiatic Company Building became available. They rented it, sight unseen. 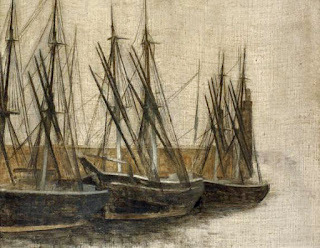 Copenhagen's "gray overcoat" is the product of the soft northern light and the muted colors of its buildings. Depending on your viewpoint, the typical grayness of the air enveloping Copenhagen is either severe or dreamlike. Its similarity to the skies over London could explain why Hammershois felt more at home there than anywhere else they traveled to. 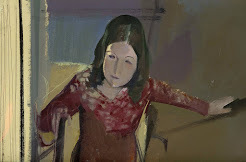 Hammemrshoi wrote home that he could never digest the elaborate decoration of Paris or Rome, if he spent the rest of his life there; he knew exactly what - and how much - stimulation he needed in order to paint. Christian IV (1577-1648) was the Danish King as master-builder; his town and city projects fill up the fingers of both hands and then some and still exist in Sweden, Norway, and Germany as well as in Denmark. Christianshavn began as a program to fortify the capitol city of Copenhagen in 1612. To this end, earthen embankments were built up in the marshy area between the city and the island of Amager to its east. Christian employed Johan Semp to create an urban plan for Christianshavn in 1617. By 1639 it had become an established merchant enclave. Strandgade (Beach Street) extended the full length of the island, following the harbor front. Semp’s original intention was to build along one side of the street across from the water, leaving the beach side to provide private harbor facilities for the lot owners who could transfer goods from ships to their warehouses. Painting Tranquility: Masterworks by Vilhelm Hammershoi from SMK - The National Gallery of Denmark is on view at Scandinavia House in New York City from 24 November 2015 to 27 February 2016. II. - In Christianshavn there are canals around every corner. Warehouses and the ships that come and go, depositing their cargoes, are interspersed with residential apartments in a manner that modern zoning regulations have all but banished. A city crisis-crossed by canals is a city in need of bridges. 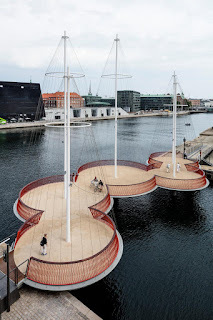 Earlier this year Cirkelbroen, or Circle Bridge, was built by Studio Olafur Eliaason near Christianshavn's south end. The five circular platforms are a pedestrian bridge that will become part of a larger pedestrian route around the Copenhagen harbor. The color red connects the bridge to the brick buildings at the side while the masts pay tribute the shipping trade that shaped and supported Christianshavn from its beginning. Eliasson believes that art makes life better, a vision similar in spirit to the philosopher Horace's dictum that the purpose of art is to delight and instruct. At the moment this is an unfashionable notion at every level. Nevertheless, Eliasson says “I hope that these people will use Cirkelbroen as a meeting place, and that the zigzag design of the bridge will make them reduce their speed and take a break. To hesitate on our way is to engage in bodily thought.” Like Kierkegaard, a century and a half ago, who walked the streets of Copenhagen in order, he said, to compose his thoughts. Note: Olafur Eliasson was born in 1967 and grew up in Iceland and Denmark. After studying at Royal Acadmey of Fine Arts in Copenhagen he established Studio Olafur Eliasson in Berlin where ninety people including architects, computer programmers, art historians, and cooks work together on projects. Eliasson’s Your waste of time was an installation at MoMA PS1 last year that consisted of several chunks cut from an Icelandic glacier, installed in a refrigerated gallery where they were on display for nearly four months. By the way there is more3 about Hammershoi on this site here and here and here and here. 1. Vilhelm Hamme3rshoi - The Old Christianborg Palace - Late Autumn, National Gallery of Denmark, Copenhagen. 2. Vilhelm Hammershoi - The Christianshavn Canal, 1905, National Gallery of Denmark, Copenhagen. 3. 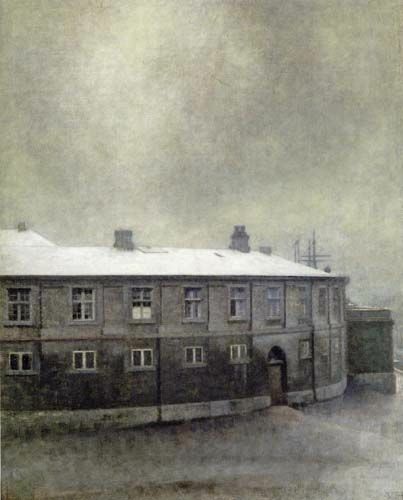 Vilhelm Hammershoi - View of the Old Asiatic Company from 30 Strandgade, 1902, on loan to the Ordrupgaard Museum, Copenhagen. 4. Vilhelm Hammershoi - The Old Christianborg Castle, 1907, National Gallery of Denmark, Copenhagen. 5. Anders Sune Berg - Cirkelbroen (The Circle Bridge) by Olafur Eliaason, Copenhagen, 2015, Studio Olafur Eliasson. 6. 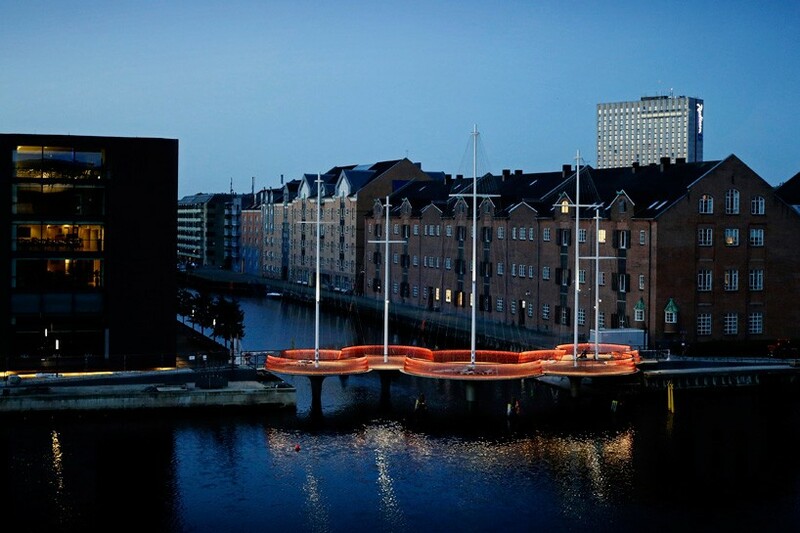 Anders Sune Berg - Cirkelbroen at Night, 2015, Studio Olafur Eliasson.